Susanna Leonard Hill: Oh Susanna - What About Word Count? In Ohio we saw a building shaped like a giant picnic basket - I kid you not! I was driving, and hence unable to engage in photography, but luckily my copilot happened to be awake just then and had his iPhone and the picture came out. Which is amazing because we were traveling at approximately 65 mph (which was the speed limit and when I say approximately I mean we were barely over it so don't raise those eyebrows at me :)) He took the photo out Princess Blue Kitty's window. Check it out! 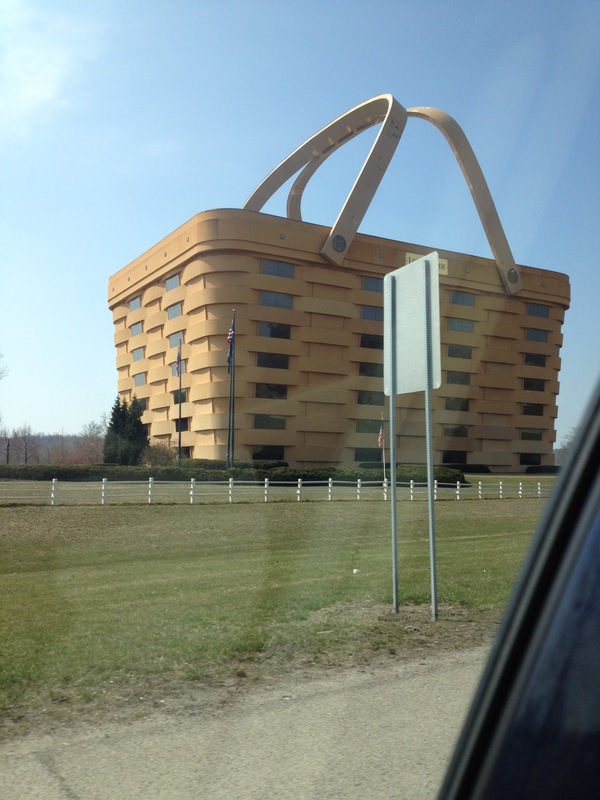 It is not everyday you see a building shaped like a giant basket! So now, see? I have added to your trivia fund. Next time you need an icebreaker or a scintillating topic of conversation, you can say, "Did you know that there's a building shaped like a giant picnic basket in Newark, Ohio? "and thoroughly dazzle and amaze your companion. Isn't it just the perfect statue for outside a library? Also, in case you were wondering (and I know you were :)), Snickers is still hands down the best candy bar ever. So now that we've got that settled, let's move on to Oh Susanna, which it feels like we haven't done in an age! I have an Oh Susanna! question - is there a 'rounding' rule when adding your word count to a query? As in, my manuscript is 509 words. Or perhaps 497 words. Do I say OH SUSANNA'S STORY is a 500 word fairy tale for readers ages 3-6? Or should I use the exact number of words per my Microsoft Word for Windows count? Just wondered if there is an word count convention that I should know. Word counts are not that necessary for picture books UNLESS there is a certain restriction. Word counts are needed for easy readers because each level determines how many words. Though it doesn’t hurt to mention word counts in the query letter—only because some editors may be looking for something short and sweet to read right then . . . It doesn’t matter—unless there are guidelines—if the word count is exact or not. Though since WORD does give it to you fairly easily, it’s not hard to do so. Susanna, that building is the Longaberger Basket Building! I own one of their small baskets which you used to only buy at parties (like tupperware parties) They were specially made. I even have the book about the Longabergers' founder and how he got started. When I taught in VA, the staff there was really into Longaberger. So there you have it! How cool you drove past the bldg. And I like your word count answer from you and Erin. Happy driving! A building shaped like a basket. It is not a good idea to say one has seen it all because a picture like that will prove you wrong lol!! Because I write YA, word count is the typical part of the query. Most agents accept rounding up to the nearest hundredth, like 51,078 as 52,000 but it's always good to review submission guidelines as I've seen some of them specify if they want rounded up or the exact word count. Tina, thanks for the info on the building. It is so interesting! Susanna, I'm glad to know about the word count information for picture books. When you think about it, the length is kind of obvious from the number of pages, e.g. 2 vs 6, or something like that. I'm so proud of all the hard word it takes to get a pb ms down to where it needs to be--I always include the word count! Just when I thought I had seen everything you post this amazing photo! I love the basket and I love that Tina Cho gave us the fun facts about the basket! In computer lab I used to have my 5th graders do a power point-each student giving facts about an assigned state. We used roadsideamerica dot com. They had the world's largest ball of twine, smallest church, giant armadillo, and so many other really fun items. They need to add the Longaberger Basket Building! Oh yeah! We were talking about word count. I always get specific. In fact, one time I worried that I didn't change it at the top after revising! Isn't that silly??? Like an editor or agent would say, "Nope! File 13! She's 16 words off on her word count! I will not take manuscripts from someone who either can't count or is prone to lies!" Sounds like you had a great trip despite Jo-Jilly! I'm glad you took charge! Longaberger basket! I only know that because I went to a party where someone was selling them. :) And I agree, Snickers are the best! I always include the word count, but round it to the nearest ten. Someone along the way told me to do it that way, so that's what I do. I am so glad you made it safely home in time for us to hang together on a windy bridge yesterday. I LOVE audio books and plan to listen to Herriot next, on your recommendation. Gosh, I was surprised at Erin's response. I do always add the specific count! How crazy is it that you're half way around the world and you know what that building is?! Thanks for enlightening me :) And glad you found Erin's thoughts helpful! The basket building is beautiful. I would have been too tempted to drive past it without stopping. Can Jo-Jilly make a return trip? :-) I have a photo from Maine where I posed as a small child in front of a cheese shop shaped like a cheese wheel. I believe the entrance was in the spot where the 'wedge' was cut. Love the statue as well. Very little information online about its sculptor, Diane Powell. Would love to see more of her work! Oh, I want to see you in front of the cheese! And I didn't even know who the sculptor was - clever you! - but the statue is lovely! I found it. I was spelling it wrong when I searched...longaBURGER...I wanted a burger in my longaberger!!! I have never seen that picnic building. Newark and Granville are about 2 hrs from where I live. Used to spend a lot of time in Granville and at Kenyon College. I sometimes round out my number if it is 602, I'll use 600. Sometime not. Glad you're back. As for word count, I generally quote the exact count, although sometimes it looks weird to do so. 561? 672? I totally love that easter egg, and now I'm thinking I feel some time-wasting coming on looking at roadside attractions :) I'm an exact word-counter too - seeing as how MS Word makes it so easy :) Thanks for sharing! . Love the photo, Susanna...the old Sunday Morning with Charles Kuralt used to feature restaurants around the country that had huge advertising statues...maybe you and your son can send that photo in someplace. I want to go on a picnic there. I always include the exact word count. I just think it's so cool that you can be driving along minding your own business and see such a thing by the side of the road! :) Thanks for sharing your word count policy, and glad you found Erin's comments helpful. She is wonderful and very generous to us! I'd like to see the picnic that requires a basket that big! :) And thanks for sharing your word count policy! Good ? on word count since a lot say under 500. I used to round it to the nearest five places but i've started giving exact number. Glad your trip went okay! Welcome home, Susanna! I do include word count (an exact one). And I found out recently when pitching an agent that they ask for your word count right off the bat! Thanks for the welcome, Kirsten :) And thanks for sharing that about the agent - I didn't know that and I bet other people will want to know too! That is the coolest building. EVER!!!! I am curious, though, why a basket.